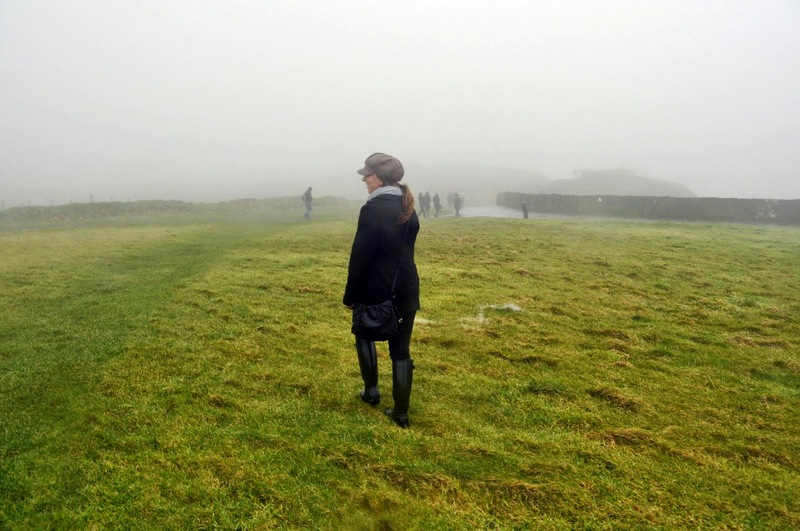 When I first decided I wanted to study abroad in Ireland, I envisioned galloping though the rolling green hills and fields of heather on horseback–you can stop laughing now. This is literally what I pictured when I thought of Ireland. A very romanticized image, I know! Funnily enough, sometime before the big move my sister sheepishly looked at me with a silly grin and told me she had always imagined horseback riding through Ireland. We couldn’t have squealed louder when we realized we both had the same ridiculous and specific image in mind! We must be related! Why did this random idea pop into our heads? I don’t know. Maybe from the movies? But I can’t really point to a specific movie that spurred this idea. We’re not big horse people whatsoever, although she did take lessons growing up. So I don’t really have a reason why we both wanted to do this. Whatever the case, we decided it would be our mission to find some horses and gallop around Ireland–a very vague plan indeed. She generously decided that would be my Christmas gift–a horseback riding excursion in Ireland! If you are visiting Dublin, I think this excursion would be a great addition to any week long trip! The nearby Wicklow Mountains was the perfect backdrop for a horse ride, as well as a beautiful natural landscape to explore outside the city. My sister was living in Germany at the time so we planned to do this together on one of her visits that spring. Since I was living in Dublin, my sister found a company operating out of the nearby Wicklow Mountains. The company provided transportation to the stables stopping at famous vistas throughout the mountains along the way, so it was a full day itinerary! The excursion included transportation, stops at landmarks like Lough Tay (Guinness Lake), a very informative driver (that helped me pass my Ireland history final), an hour horseback riding lesson, an hour trail ride, and all of your riding equipment. I will say they did ask if you had previous experience riding, which I think was helpful! We practiced our sitting and posting trots before setting out. The trail had a few rough spots at times and I was not used to riding in an english saddle, especially when it got steep, but all in all I felt safe and in capable hands! The trainer did start slagging me (that’s Irish for teasing!) about my hunter rain boots–too fancy I guess, but apparently both my sister and I had really good form…or was he just slagging us again?! We’ve learned we don’t really do tandem activities very well together, like kayaking or salsa dance lessons, but horseback riding we can do! The trail was beautiful and it was a lovely way to experience the Wicklow Mountains. I loved every minute of it and it fulfilled all of my cheesy Irish fantasies! This is a great excursion if you’re visiting Dublin and you want to take a day to see more of the surrounding countryside. I do have to say we were SO sore the next day, mostly from practicing our rising trots. Apparently we did them so well that maybe we got a little carried away! Maybe don’t plan this right before you get on a plane or you will be stiff for days–be sure to allow yourself some time to stretch out the next day! Thank you for this memorable day sister! As for us, we spent the next day lounging in our soreness binge watching Downtown Abbey–all in all a very lovely sister day. I’m lucky to have such a world traveling family that is always up for an adventure! How about you? Do you enjoy traveling with your family? Horseback riding excursion in Ireland is indeed beautiful and exciting. We discovered that the Wicklow Mountains was the perfect backdrop for a horse ride, as well as a beautiful natural landscape to explore outside the city. Having a vacation here is really perfect.